Selling your business is typically a complex venture that may require a lot of planning and preparation. A common question we hear is, ‘How Much Can I Sell My Business For? The first step in the process should be deciding whether or not you truly want to sell your business. While an offer today may be worth a considerable amount of money, as a business owner, you can never discount future prospects (imagine if Google and Facebook had managed to settle on early offers to sell). However, sometimes, selling is the right thing to do, especially when you feel you cannot grow the business to its full potential. Regardless of the reasons, once you’re certain you want to proceed, the next thing that you need to do is derive an accurate valuation of your business. How much is the total worth of my business today? This should be your reserve price, or the minimum amount you are willing to sell your business for. How much will the business be worth in the future? This will require that you properly analyze the trends within your industry. Any number of factors such as technological advancement, economic shocks can have a strong bearing on the worth of your business in the future. The answers to these questions will help you determine a value for your business that not only represents an adequate return on your investment, but also ensures that your business is marketable and a viable investment option to interested buyers. In this step-by-step guide, you will learn about the two essential steps to take in the process of properly valuing your business for sale. Accurately collating all the relevant business information is the first step to help you determine, ‘how much can I sell my business for?’ It is important because you require a true picture of the financial and operational state of your business, which makes it easier for you to set a fair value for it. Details of any other assets such as intellectual property. An important point to note here is that the value of any assets you own will help increase the valuation of your business, so you should not leave out any asset, no matter how small. #2. All legal information including license and registration papers. This is particularly important if your business operates in a heavily regulated industry. Missing papers will be a major red flag to investors. Value chain and any other details. These documents will show interested buyers that the business has a good chance of remaining profitable for the foreseeable future. #4. Staff, supplier and customer information. Potential buyers will be interested in knowing what kind of staff they may be inheriting, since it would likely cost them extra funds in severance packages, to fire or disengage any existing staff. Right from the get-go, most potential buyers would want to see to it that any inherited staff fits their profile. The details of your biggest accounts will also come in handy since these will be a good indication of how profitable your business is likely to remain. There is no one established valuation methodology, and you may simply choose to value your business at the price you feel is right. However, going with an arbitrary approach will typically make the sale process much harder as interested buyers will want to know how you arrived at the set value. There are various, more conventional methods that you may choose to use in the valuation of your business, and sometimes you may even apply a combination of all. The essential question here is, what is the value of other businesses within your industry? If there is historical data, you may want to go through this deeply in order to spot any trends. Your business valuation should then closely mirror the trend and if you think your business is worth more than the average selling price for businesses in your industry, be sure to explain why in your prospectus. If you were going to set up a similar business from scratch, how much would it cost you to acquire the same assets you currently possess? This amount should be your minimum valuation, using the asset value method. To derive a valuation for the assets of the business, you will need to take into consideration the cost price of those assets as well as depreciation and any improvements. Another fairly common method for valuing businesses is by taking the annual sales revenue of and multiplying it by a period such as one year, two years or three. There is no one commonly accepted period so again you will have to go through the historical data for your industry, to determine what period is most appropriate. Regardless of the valuation method you choose, selling your business clearly involves a lot of financial and managerial data and reports. How your business finances are reflected will determine your position in negotiations with potential buyers. At Park City Bookkeepers we specialize in preparing financial reports for owners looking to sell their businesses. 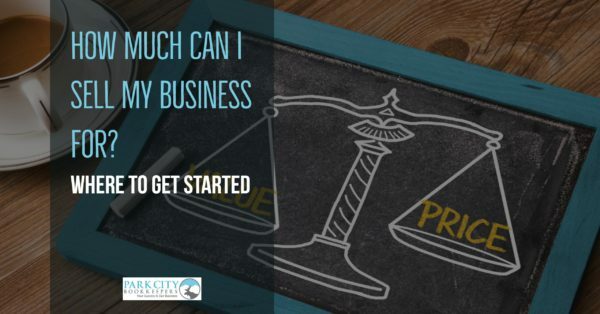 If you are unsure about how to proceed we offer https://parkcitybookkeepers.com/consulting-services/consulting services to help you get started.